Description: At nearly 10,000 acres this is the largest wilderness area in VA. Until 1950 the area was heavily mined for iron ore and manganese. Artifacts and ruins from those days are still visible as the forest tries to recapture what was once wild. It was given the wilderness designation in 1984. Even with the mining scars the area is, for the most part, a joy to hike in. 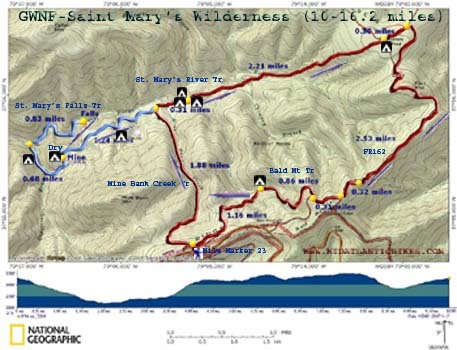 There is about 17 miles of trails and an old service road that connects some of them, making this a great place for a nice day hike or overnight backpacking trip. The tread varies from rocky footpaths, old work roads and trails almost totally engulfed by Mountain Laurel and Rhododendron. Although we spent 3 days exploring this area, here we describe an overnight trip with a pack-less out-and-back to the St. Mary’s Falls. As with most wild areas there are places that become over-used or abused and this special place is no exception. The primary route into the wilderness off of FR41 was severely damaged by Hurricane Isabel in 2003. It has not yet been repaired. 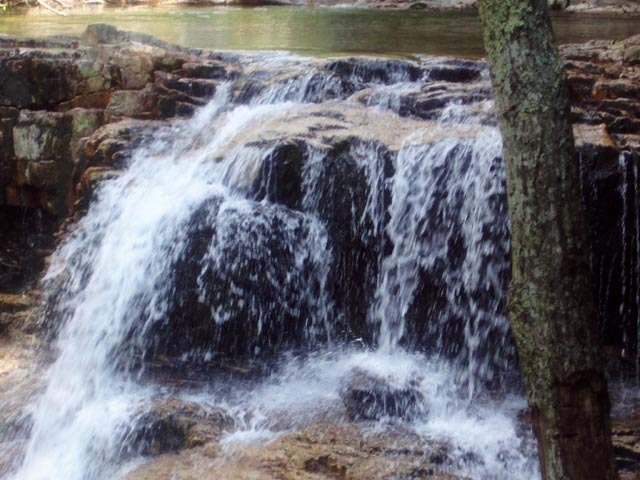 The Forest Service and Tidewater Appalachian Trail Club (The trail overseers for the wilderness) recommend using Mine Bank Creek Tr from the Blue Ridge Parkway as a means of access to the area. Still many folks (Calling them riff-raff would be kind in my opinion.) still manage to haul huge tents, cases of beer, assorted trash, etc along the lower part of the St. Mary’s River Tr and the Falls trail and illegally camp right on the trail. (NO CAMPING IS ALLOWED IN THIS AREA!!!) On our scouting trip a small group had literally taken the Falls area over as if it was thier own campground. The same often occurs at the legal primitive campsites along FR162. If you witness such abuse don’t confront the individuals but report it to the Pedlar Ranger district as soon as possible: PH# - 540-291-2188. There is an unsigned gravel road on the west side of the Parkway with a kiosk marking the trailhead. It is not signed at the road. Trail Notes: Being a wilderness area, there are no blazes. Most trail junctions are signed. For the most part, trails are pretty obvious except in areas along the river that have been damaged by flooding. Day 1: There is an old woods road that cuts across the parking area. Ignore this. The Mine Bank Creek Tr is the footpath that starts to the left of the kiosk. Follow it, passing the junction with the Bald Mountain Tr on the right. (This is your return route if doing the 10 mile loop.) As you descend you will cross Mine Bank Creek 5 times. The first is usually dry while the others are typically rock hops. The gorge is pretty scenic with many little chutes and falls, many with their own little swimming hole at its base. In 1.88 miles reach the junction with St. Mary’s River Tr. Turn right. Cross Mine Bank Creek for the 6th time and in 0.31 miles from the trail junction cross another stream. Immediately pass some old concrete foundations from the old mining operation on the left. Enter a large, shady and grassy area. This is a great camping spot. A better one is along a footpath on the left right next to the river. Set up camp here. 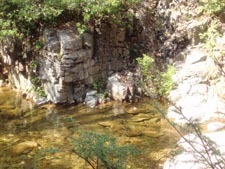 To visit the other mines, falls and swimming holes retrace your steps to the Mine Bank Creek Trail junction. 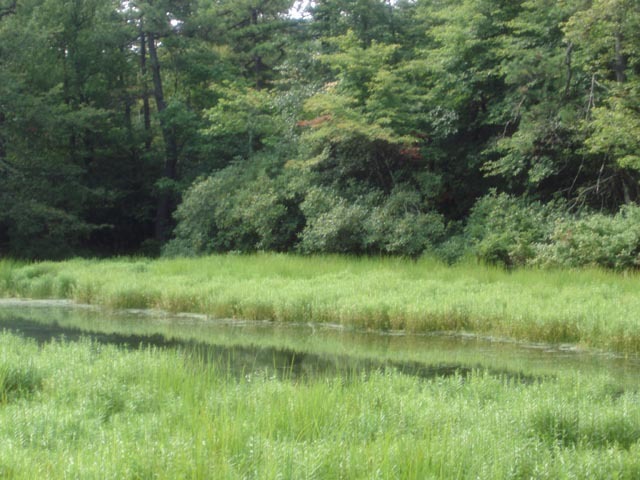 Follow the St. Mary’s River Tr downstream. 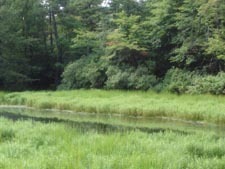 The trail will gradually leave the river and climb a bit. It will then snake through a stream fed cove where you might find a small campsite and some unexplored mine areas on a spur trail to the left. Continue on the main trail and cross the stream. In 1.24 miles from the last trail junction there will be a side trail to the right that climbs a high bank. From here you can see the surrounding mountains and the vestiges of a mining operation below you in a bowl-shaped area. Take time to explore it, either now or on the way back from visiting the falls. The place is honeycombed with trails but the main route will always be on the other side of the man-made bank. On the other side of “The Bowl” the trail will descend steeply from the bank and enter a beautiful hollow formed by Sugartree Branch. If you are running out of time or energy and still would like a nice refreshing soak before returning to camp you’ll be sure to find an acceptable pool here. 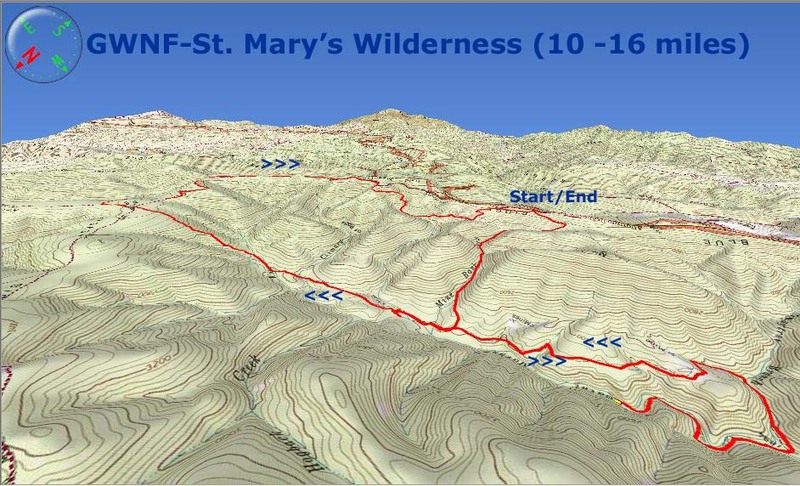 In 0.68 miles from “The Bowl” arrive at the junction with the St. Mary’s Fall Trail and turn right onto it. Almost immediately ford the river. From here to the trail’s end you will pass numerous swimming holes. In about 0.3 miles the wide, flat trail reaches a blow-out. It continues as a narrow footpath to the left around the blow-out to rejoin the old trail on the other side for a short distance. The trail then seems to end at a set of 10 ft high cliffs. 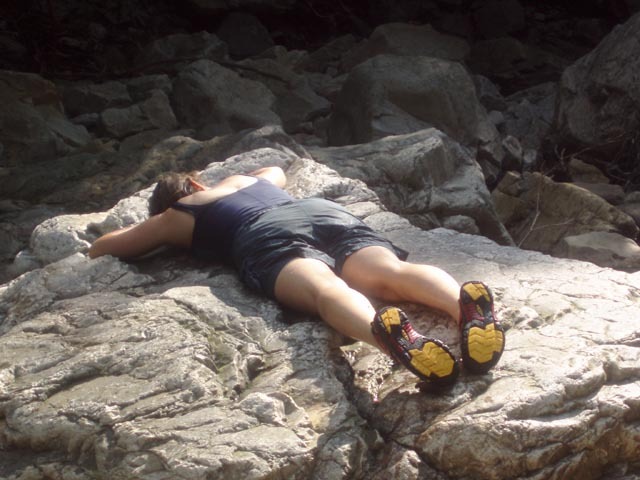 Either scramble down the cliffs or backup a bit and slither down between the rocks to the riverbank. Ford the river for the last time. In a few yards reach the 20 foot tall St. Mary’s Falls. 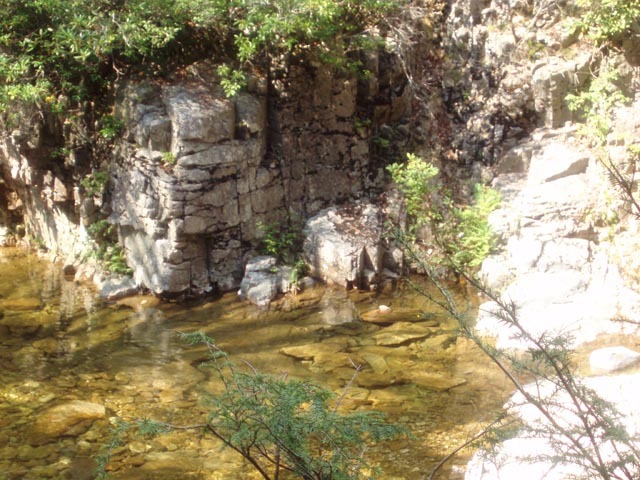 As you return to camp take time to visit the many swimming holes and mine ruins if you haven’t yet done so. Day 2: If your main goal for the trip was to visit the mines, falls and swimming holes you can break camp and retrace your steps back to the car. The climb back up Mine Bank Creek is pretty steep in places so take your time. Use the cool pools to refresh yourself along the way. To complete the Backpacking loop described here return to the grassy area. There will be a well-worn trail going up a steep hill (away from the river) and one going around the hill. Both trails connect on the other side. The one going steeply up the hill passes through a 1-tent campsite w/fire ring. I prefer taking the easier grade around the hill to the right. From here the trail gradually climbs away from the river before paralleling it but at a much higher elevation. As before, at times the trail will be almost totally engulfed by Mountain Laurel and Rhododendron. As Tina at the RD would tell me “The Mountain Laurel is so thick down there you couldn’t throw a cat through it!” You’ll cross Chimney Branch and then the main river (a mere stream at this point and the last “good” water for about 5 miles.) before beginning a steep climb. You’ll ascend approximately 900 feet in less than a mile. Joining a rocky old jeep road and a couple of short switchbacks do little to add any comfort. As you near the top look behind you for a nice view of Bald Mt. You’ll be walking in its shadow latter on. In 2.21 miles from camp the trail flattens in an area called the “Big Levels”. The name conjures up visions of expansive views of the surrounding mountains … but there are none. Instead you are surrounded by Mountain Laurel and forest. Still it is a pretty nice walk along a flat, sandy trail. Soon reach a kiosk and clearing. The remnants of FR162 cross in front of it but I believe it was relocated to its current location to protect the fragile microenvironment of the unique Green Pond area. (There is camping here but I am not sure of the quality of the water but the name “Green” worries me!) After visiting the pond and the Sphagnum Peat bog that surrounds it follow the main trail for another 0.3 miles to its terminus at FR162. There is no sign here but the battered dirt road is quite obvious. It is open to those with vehicles that can handle the conditions. Turn right and soon pass the terminus for the Kennedy Ridge Tr on the left. There may not be a visible sign here. (Often the Forest Service places signs about 20 feet or so down the trail to discourage removal by mischievous sorts!). You’ll follow this road for approximately 3 miles with a couple of modest uphill grades. At 2.53 miles you’ll come to a campsite on the left frequented by car campers. If not occupied it offers nice views to the southeast and east. As you look out there will be a footpath to the left. This is the terminus of Mill Creek Tr that runs through the valley below, an area we hope to visit soon. Proceed up the road for another 0.32 miles where the road forks. The left fork goes to a lookout tower. I do not know its condition/availability or if it offers views. You want to take the right fork. In 0.31 miles keep an eye out for an obvious footpath on the right. There is a signpost but no sign. Turn onto it and in about 20 feet pass a sign for the Bald Mountain Trail. As you descend toward Bear Run you’ll pass through an area of dense blowdowns that have been cut through or worked around by volunteer trail crews. These were the result of the severe Gypsy Moth infestation of the 80s. Although the trees died over 20 years ago they are still falling down! After you pass through this area you’ll cross the stream and pass a small campsite on the right (0.86 miles from leaving FR162). This is the last campsite and reliable water source until you reach the end of the trip. In another 0.9 miles or so the trail forks. To the left is an old grassy road. Recent cuttings suggests that it is maintained. This could be the woods road that crosses the parking area but we didn’t check it out. If you don’t feel up to the adventure bear right, staying on the footpath. In another 0.3 miles arrive at the junction with Mine Bank Creek Tr. Turn left and soon arrive back at your car. Critique: Parked at the BRP and hiked Mine Bank to the junction of the River trail. This trail is clear of blowdowns and seemed very recently cut back. Other trails are mildly overgrown but still passable.) We turned right and hiked 0.3 miles to the group camp described above. Easily room for 3 or 4 boy scout jamborees here. Saturday we did an out and back to the Falls. The best swimming hole, in my opinion, is just upstream of the lower falls - 10 ft. deep, clear water, complete with rope to haul yourself out with and plenty of rock ledges for canonball jumping. 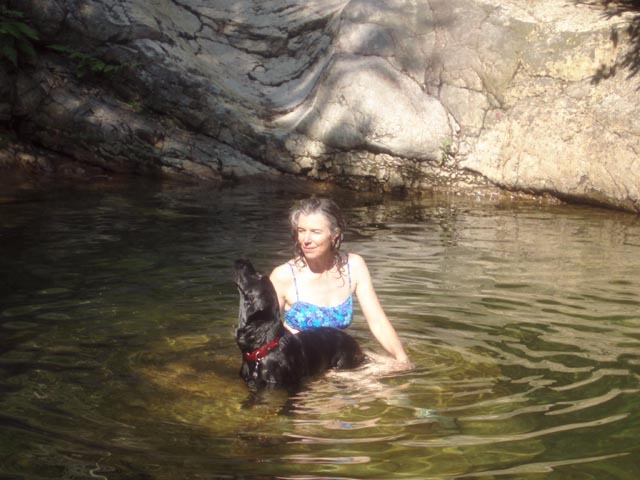 Critique: I've been drawn to the St. Mary's because it is a nice large wilderness, with a nice swimming hole, fairly close to home. Unfortunately, it has a few shortcomings. My early trips have always been out-and-back to the falls using the lower trail from the FS road and parking area. As noted in the description, this trail was badly damaged by Irene and only continues to deteriorate. There have been a series of heavy storms and flooding events in this area in late 2010 and early 2011 and the lower trail has deteriorated noticeably in the past year. This most recent trip was a two night backpacking trip in which we went in by way of the lower falls trail, camped the first night there and then moved in the morning to the campsites near the intersection of Mine Run trail and the River trail. This was a lovely camping spot - there are several great sites right next to the river and we brought a filter so we had all the water we could ask for. We did the rest of the loop with just day packs. This is not an 'easy' hike, but it is moderate; the climb from the valley up the river trail to the Green Pond area is pretty vigorous for the last short stretch, but most of it is moderate to flat. This would be a tougher climb with a full pack. However, as the loop is laid out, it's not bad at all. If you were set on camping at Green Pond, you might reverse the direction since the climb up Mine Run Trail seems easier than the other (though it's also steep). The other unfortunate part was just that views were only so-so, except from the Flint Mountain overlook. Still, not crowded and fairly clean. 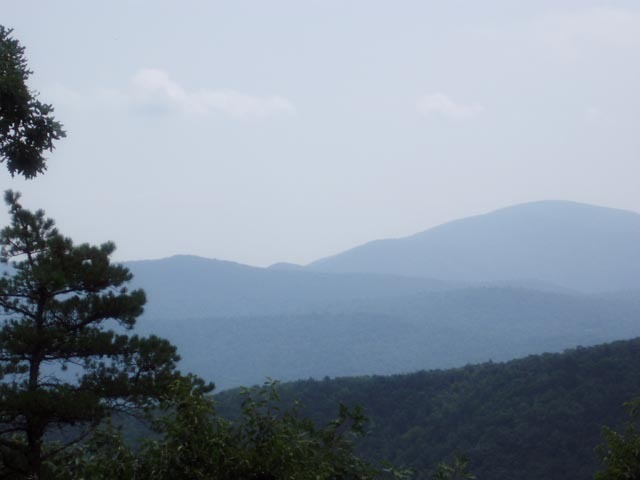 Critique: While I do not consider myself an expert, I have done several hikes in and around the GW National Forest and Shenandoah mountains. The loop, as described on this website, was very challenging as an overnight backpacking trip. We hiked in as described from the Blue Ridge Parkway, and set up camp at the junction of the Mine Bank Creek Trail and the St. Mary's River Trail. We then attempted to hike down to the falls (without packs), but it was getting late in the day and the trail was taking longer than anticipated, so we did not actually make it all the way to the falls...I expect there was not much to see as the creeks and streams were all running fairly dry. The campsites we passed and the one we stayed at were all littered with trash, toilet paper, and even human waste. It is obvious that most visitors do not adhere to proper LNT practices. On Day 2 we continued the loop hike east on the St. Mary's River Trail. The description on this website does not do justice to the steep uphill grade to reach the Green Pond area and the junction with FR 162. It was extremely difficult with a pack on and would be challenging at the least w/o a pack. FR 162 also has some hefty uphills that are at least laid out as switchbacks. We took the Bald Mountain Trail down to Bear Branch as described. This trail was very narrow with a steep downhill grade. It was also very rocky and overgrown with rhododendron and mountain laurel, and there were many fallen trees blocking the pathway. We had orginally planned to camp one more night and then make the remaining mile hike out the next day, but we decided it would be best to just get out of there and head home to a nice shower and comfortable bed. The hike back up to the Blue Ridge Parkway was not too terrible, although it felt almost impossible to me as my legs were mush by this point. My husband and our 2 dogs faired a bit better than I did. The best part of the trip was the few encounters with other hikers and folks visiting the area by vehicle on the FR. Everyone was very friendly and out to enjoy a beautiful day in the mountains. This would be a challenging, rewarding trip as a day hike, but with a back pack, it was unenjoybale. Critique: This hike had a couple of highlights, notably the falls on the Saint Mary's River (nice swimming), and the overlook at Flint Mountain. We also came across a few of the old mine sites, which was pretty interesting. We did the backpacking loop, but found that a lot of this trip is in really thick forest and it's hard to catch a glimpse of any overlooks. Also, take the advice to heart: once you leave the river and ascend to Green Pond there's no water for a *long* time! It was very hot, and we were getting really low on water by the time we descended to a barely running creek near Bald Mountain. Critique: This is an excellent hike. Super fun and full of interesting things to see along the way. I took my sister and nephew out on this short over-nighter in early June last year and we had a great time. We encountered a number of different mushrooms and a variety of small falls as we descended to the creek. Mountain laurel increases a bit further down the gorge. Campsites were easy to find and well isolated from the trail. Watch out for copperheads in the summer, I almost stepped on one on our dusk hike towards the falls. We really enjoyed this hike. Critique: Thanks an awful lot for the trail notes -- they were indeed quite helpful. We just did an out and back to St. Mary's Falls, and it was fantastic. We were very fortunate to have caught the leaves close to their height of color and just wished it had been a drop warmer so we could've done some swimming! Two notes: 1) On the way to the falls, there's a fork in the road about 3/5ths of the way there that unnecessarily confused us. To the right, the path goes up a hill into a weird looking field; to the left is a path continues into the woods. It's easiest to bear to the left (although on the way back you can cut across the field and you'll figure out where you are). 2) If you go to the Falls for this out-and-back, it's downhill almost the entire way there, and respectively, uphill almost the entire way back. Budget your energy and time accordingly! Critique: The Rhodos and mountain laurel were in full bloom making for a picturesque trip. 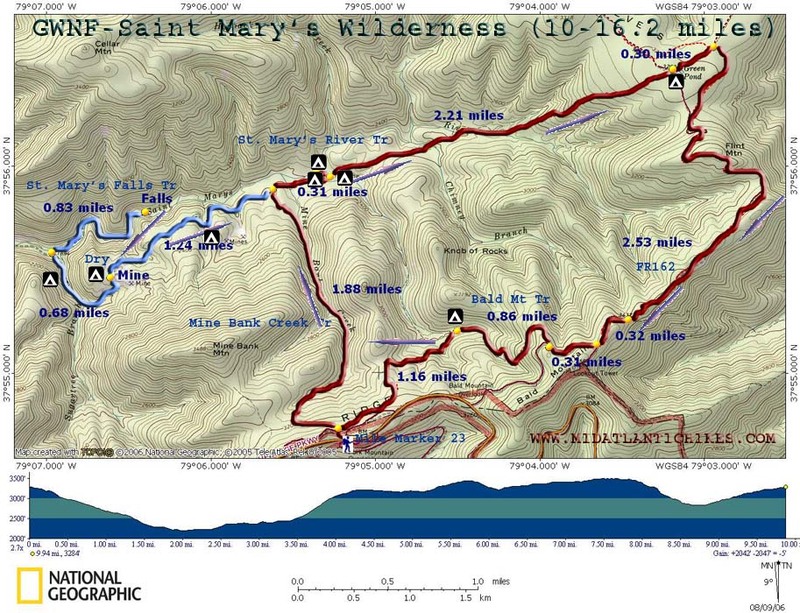 Your trail notes and topo were a huge help. The side trip to St. Mary's Falls made this a perfect length for a weekend backpack. The group campsite you suggested was fantastic. Day 2 with the road walk was less exciting than the hike on Day 1, but someone or group must have cleaned up the fire road, there was very little litter. Thanks again for all you do, Mike.